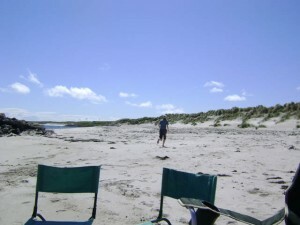 The most westerly of the Inner Hebrides, Tiree is about 10 miles long by about 5 miles wide at it’s widest. Located about 20 miles off the west coast of Scotland the island benefits greatly from the warming influence of the Gulf Stream which gives warm, pleasant summers whilst generally keeping winter temperatures milder than those on the mainland. It is the perfect place for peace and tranquillity – a holiday cottage in Scotland with wide open panoramic views, fantastic beaches of pure white sand and a vast array of wildlife ranging from seals to basking sharks. Tiree is generally low lying which provides long ranging views across the island however there are also 3 high points on the island with the highest point, Ben Hynish, providing spectacular views to the Isle of Mull, the Small Isles, the Scottish mainland and even the Outer Hebrides on clear days. 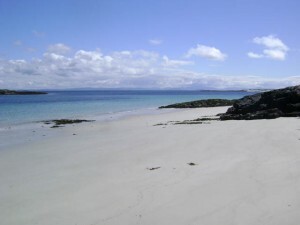 The West Coast of mainland Scotland, and holidays in Scotland generally, are often associated with heavy cloud and high rainfall – but not in Tiree. With the island being predominantly low lying it generally doesn’t get the same amount of coastal cloud formation and Tiree is in fact one of the sunniest places in Britain. You can often be sitting on the beach in glorious sunshine in Tiree whilst at the same time you can see heavy cloud over the mainland 20 miles away. The island also has a reputation for being windy at times and is actually one of the most popular locations in the UK for water sports enthusiasts and hosts the annual Tiree Wave Classic competition attracting wind and kite surfers from far and wide. The cottage is the perfect holiday home to rent if you want to spectate at the Wave Classic week since it’s only 10 minutes drive to the main event locations. Of course, the wind isn’t always blowing that hard but when you’re thinking about a break in Scotland, the presence of the steady, light breeze is enough to keep the midges away and therefore Tiree doesn’t suffer the same levels of summer midges that can be a source of irritation across large parts of Scotland during the summer months. There is plenty of island history waiting to be discovered and, with literally miles and miles of beaches, there is as much walking, cycling and fresh air as you can possibly manage if you’re planning to visit Scotland. The island is easily accessible by sea and air – there are daily flights direct from Glasgow, so the quickest option is to fly via FlyBe from your local airport to Glasgow and then catch the connecting flight from Glasgow to Tiree. Make sure you pre-book a hire car and it’ll be waiting for you to collect from Tiree airport. There are also several flights a week from Oban to Tiree. Alternatively, if you prefer, you can take your own car onto the island using the car ferry service which operates from Oban. For a truly fantastic, peaceful and unspoilt Scottish holiday experience, visit Tiree – you’ll come back time and time again.